2019 Dockage/Mooring at Town River Marina. Fill out the License documents and sign where indicated. Include deposit and insurance certificate. Return by postal or e-mail. Once your complete package has been received, we will contact you with your space assignment. Town River Marina is located at the sheltered head of Town River Bay in Quincy, Massachusetts off the Fore River. We are a family owned and operated facility that caters to individuals interested in sport fishing and family oriented boating. 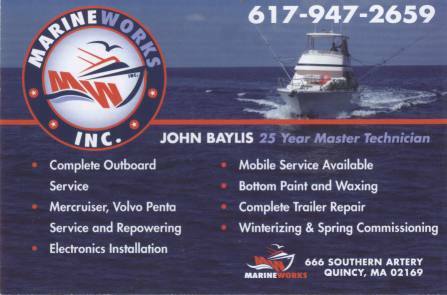 The services we offer include summer dockage, mooring rentals and servicing and a launching ramp with good access to Boston Harbor and Massachusetts Bay. Dry storage is available during both winter and summer seasons for power and sailing vessels. St. Croix and Lamiglass rod dealer.